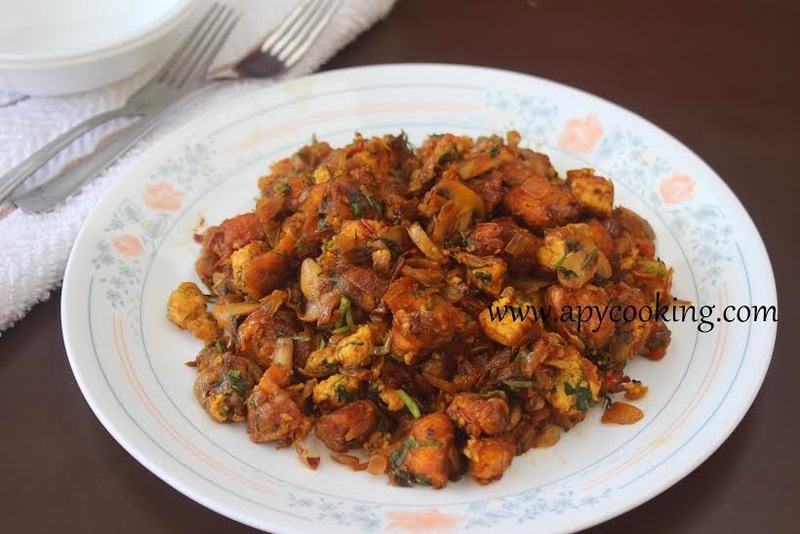 If you like paneer and mushrooms and are looking for an easy, one pan dish for breakfast, lunch, dinner or even a tea-time snack, then dish is for you. You could say this dish is a spin-off of my earlier post on Stumber which, btw, tastes great if you eat eggs. 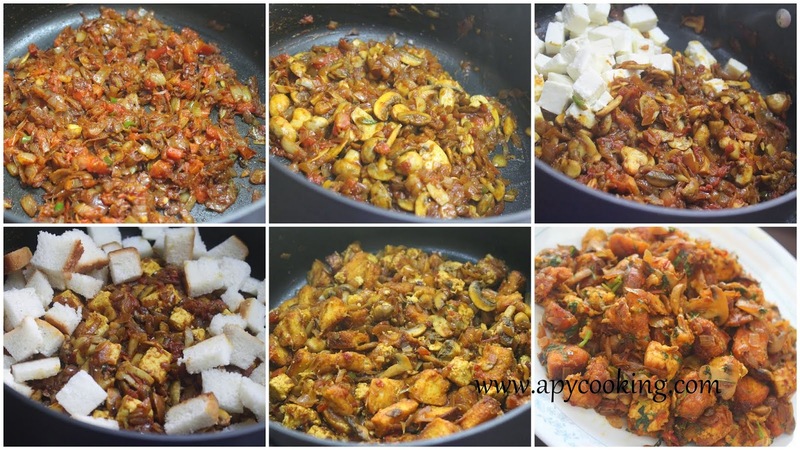 I replaced the eggs in the recipe with paneer and mushroom one day, because I wanted to, and loved the result. Go ahead and make this. 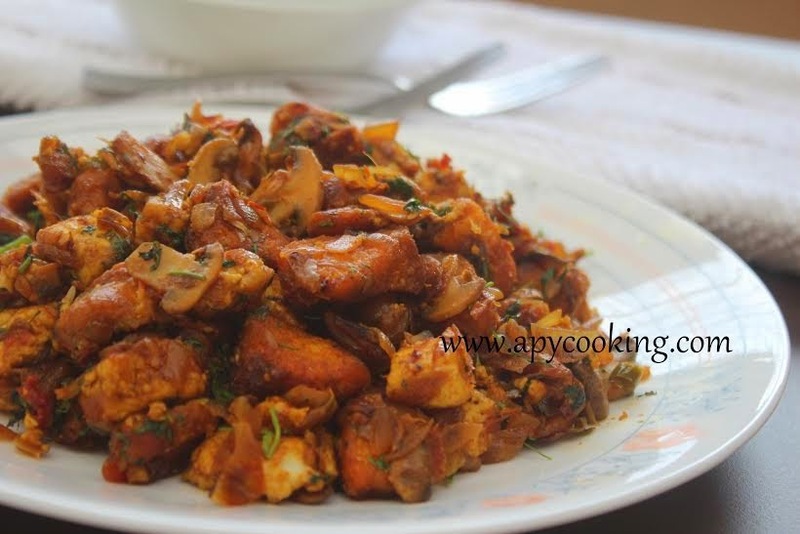 The bite of mushrooms, the creaminess of the paneer and the softness of the bread will make you want to make this again and again! Oh and just a small tip. 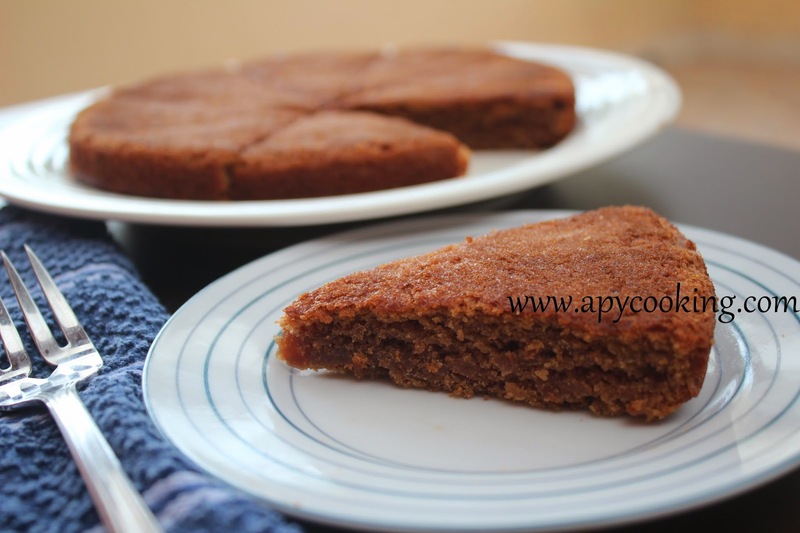 if you have no problem with using an extra couple of spoons of ghee, go ahead and drizzle it. Ghee lends a lovely flavour to this dish. In a large pan, heat 2 tbsp ghee. Add chopped onions and sauté till they become brownish. Now add chillipowder and roast for a couple of minutes. To this add finely chopped green chillies and chopped tomatoes and roast till the tomatoes are completely cooked. Add garam masala powder and haldi powder and roast for a minute. Now add chopped mushrooms and 1 tsp salt and cook for a few minutes. 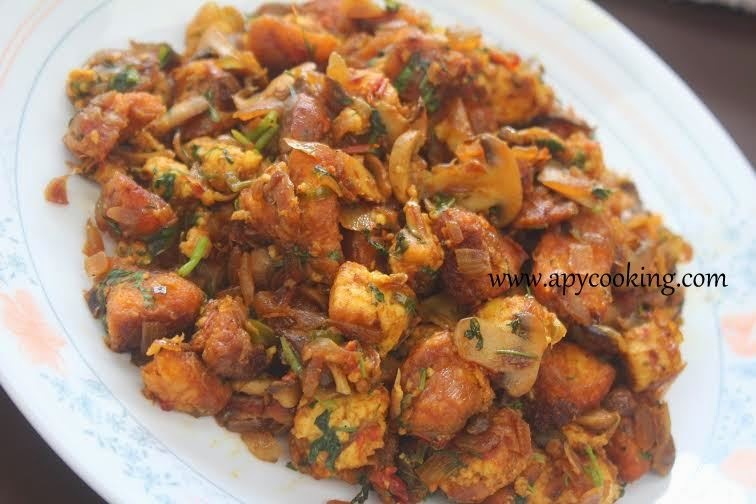 To this add paneer chopped to 1" cubes and mix gently. Cook for a couple of minutes. I added another 3/4 tsp salt. Now add bread chopped to 1" cubes and mix. Cook covered on low flame for a couple of minutes and mix well. Adjust salt and spices according to your taste. Sprinkle chopped coriander leaves and mix well. 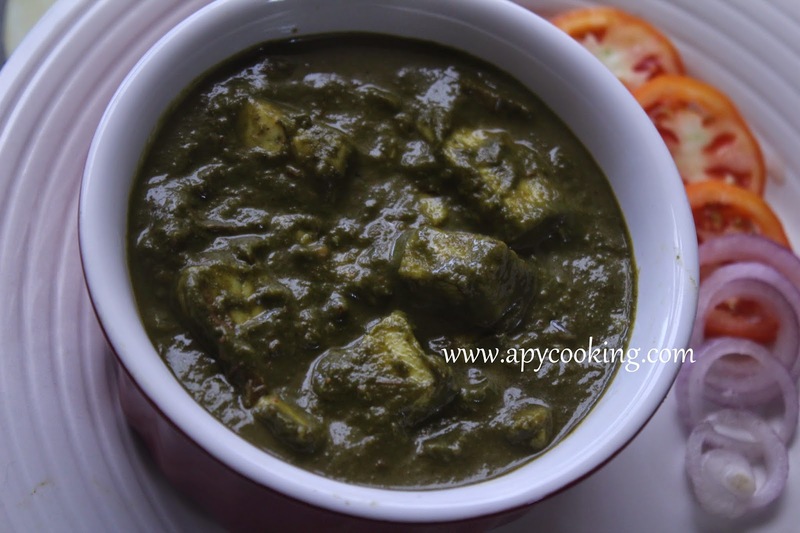 Many a times when I have had palak paneer, in a restaurant or elsewhere, I couldn't help noticing the difference in the shades of green this dish comes in. Cooking the dish for an extra few minutes can slowly deepen it's colour. Some like to cook the palak minimally to retain it's colour while some overcook it to make it a lot darker (unknowingly so). Some add milk or cream which makes the colour lighter while others prefer to just go by water. 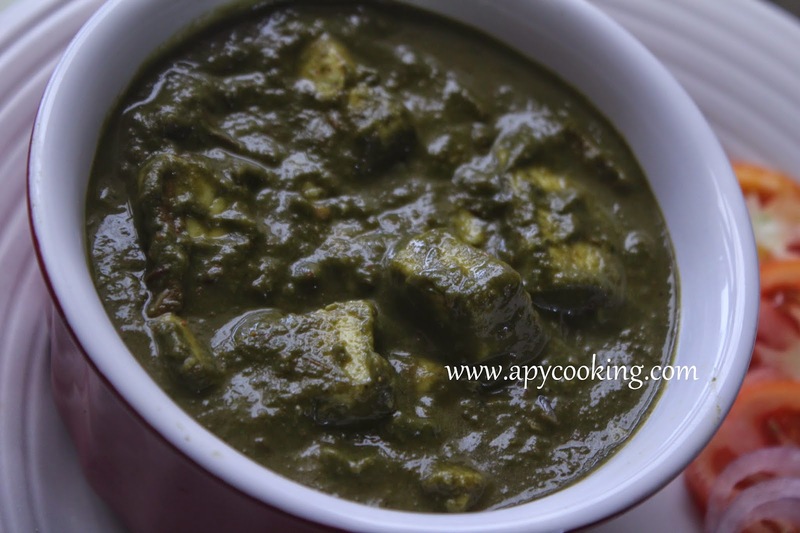 Though I like all the different shades (because I love palak paneer), I invariably tend to overcook the dish, probably because in the back of my mind I like the colour to ripen from a rich emerald to a deep olive green. Wash palak (discard the stems) and boil with ginger in half a cup of water for a few minutes. Allow to cool. Drain the water out but reserve it. In a deep bottomed pan, heat oil/ ghee. When it's hot, add cumin seeds. Once the seeds splutter, sauté chopped onions. Add crushed garlic and ginger or their paste and sauté till the onions turn brownish. Now add the powders and roast for a couple of minutes. Add chopped tomatoes and sauté for 4 to 5 minutes till tomatoes are cooked. Allow to cool. Transfer half of this into a blender. 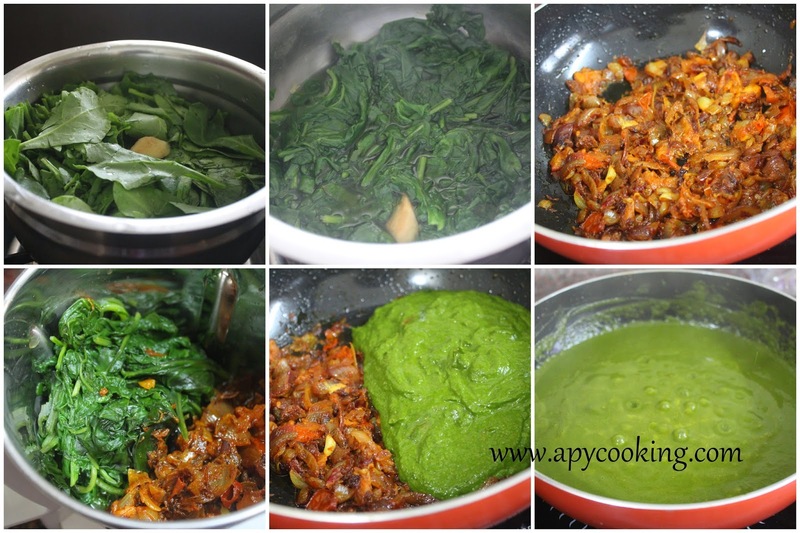 Add the boiled palak also into the blender. Blend into a smooth paste. Transfer this back to the earlier deep bottomed pan. Mix the blended paste with the rest of the sautéed onion mixture. Add the reserved water and bring to a boil. Add enough water to get a gravy like consistency. 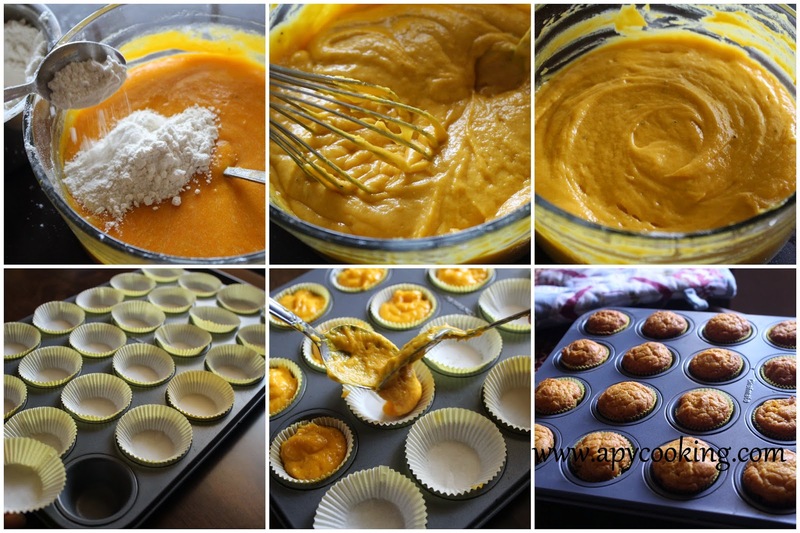 You can also add a couple of tablespoons of milk or cream. Add salt and bring to a boil. Now add the paneer cubes. You can fry paneer before adding. I did not fry. Cook for a few minutes. Tastes best with rotis / chapatis. Under all the beautifully hand crafted fondant, the deliciously flavoured frosting and the subtle, creamy filling, lies a simple cake that holds these elements together. 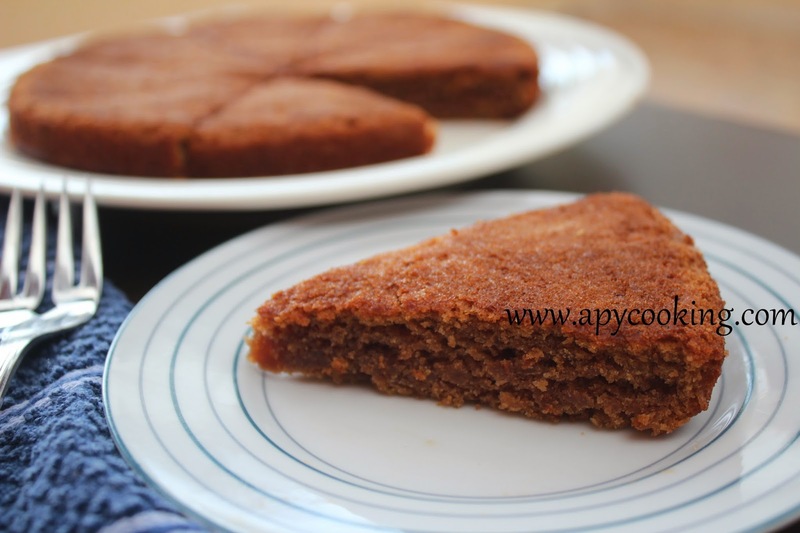 Here's a recipe of one such cake. 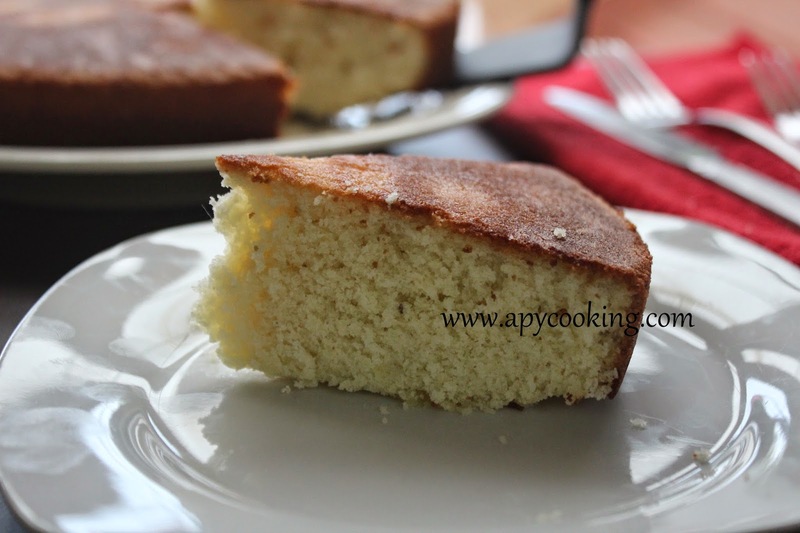 This is a vanilla cake by virtue of the vanilla essense I added, but you can experiment with any flavour of your choice. 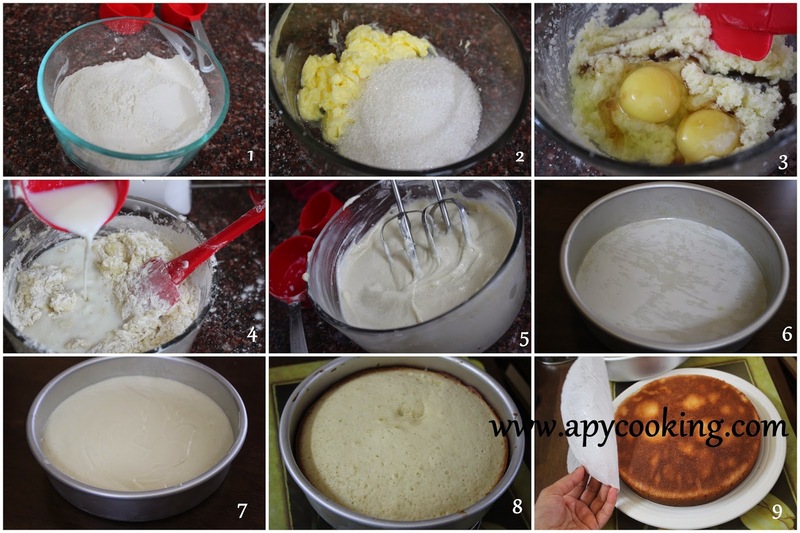 Another similar post that I have is of a simple yellow cake which is very easy to make, but I wanted one which required only 1 cake pan. So I went ahead and halved the ingredients of the famous 1234 cake adjusting butter according to the way it's packaged in India. Here we get butter in 100g slabs unlike the sticks it comes in elsewhere. 1 stick equals 113 g or 1/2 cup while a slab weighs 100g. 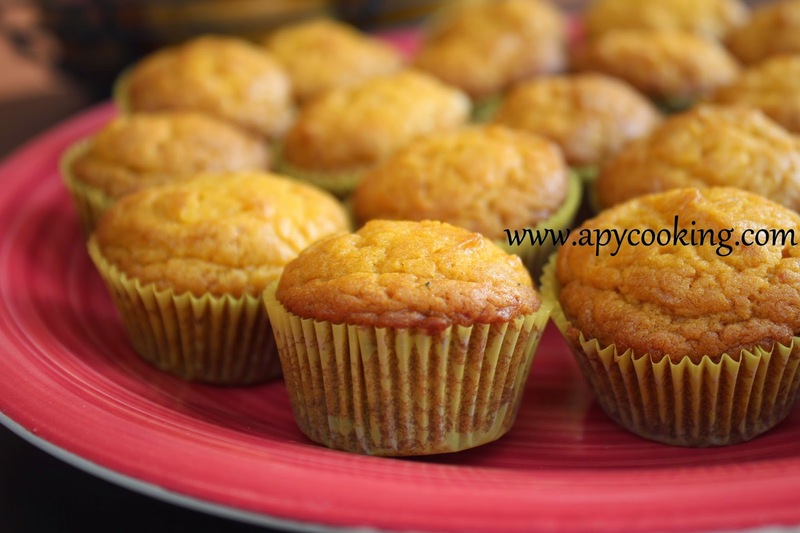 -All the ingredients, specially butter, should be at room temperature. 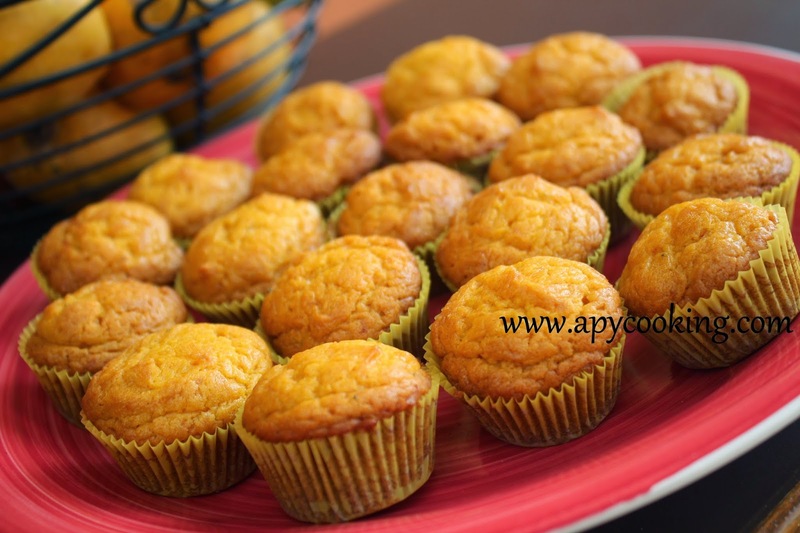 -Baking powder is different from baking soda. -Please check the contents of the butter. If it has salt, don't add extra salt. You can add a small pinch if you want to. I forgot the butter was salted and I did add a pinch, but the cake turned out fine. Besides, I like salt. If the butter is unsalted, add a good pinch of salt. 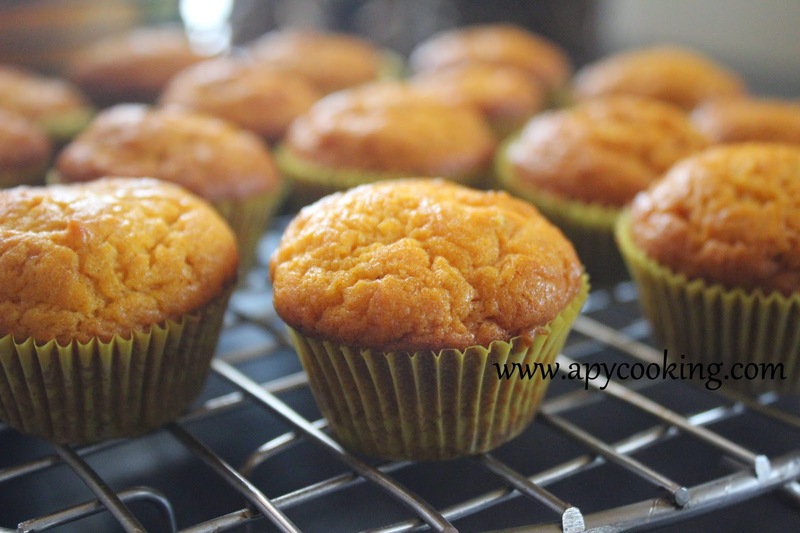 -Try and use castor sugar (thin granules) if you want the butter and sugar to cream beautifully. 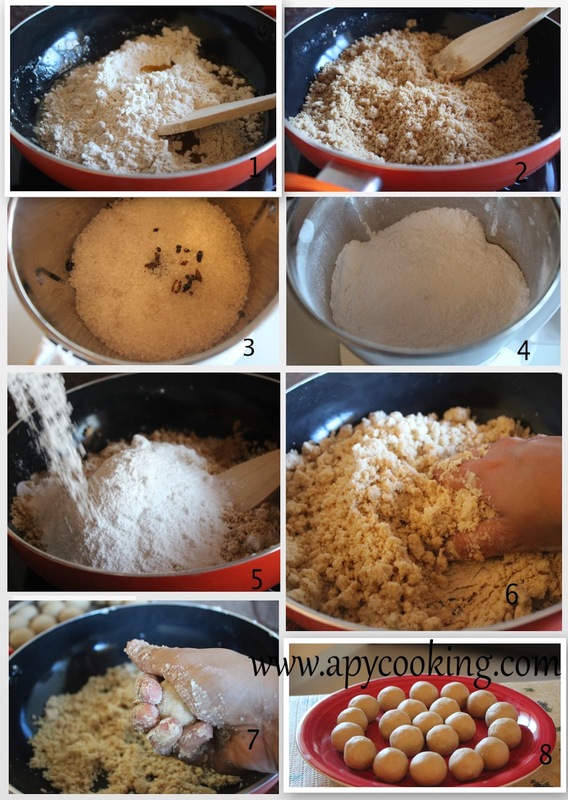 I used granulated sugar which I found in my nearest small grocery store. The kind you run to after you start cooking. This sugar was very stubborn and did not want to get creamed easily. -Try to get your hands on good quality vanilla essence. Always smell it before you add it. There was a time when I threw my cake because the synthetic vanilla essence I used was horrible. It was horrible. Did I tell you it was horrible? -Try to get your hands yet again, on good quality parchment paper. It's a big boon. 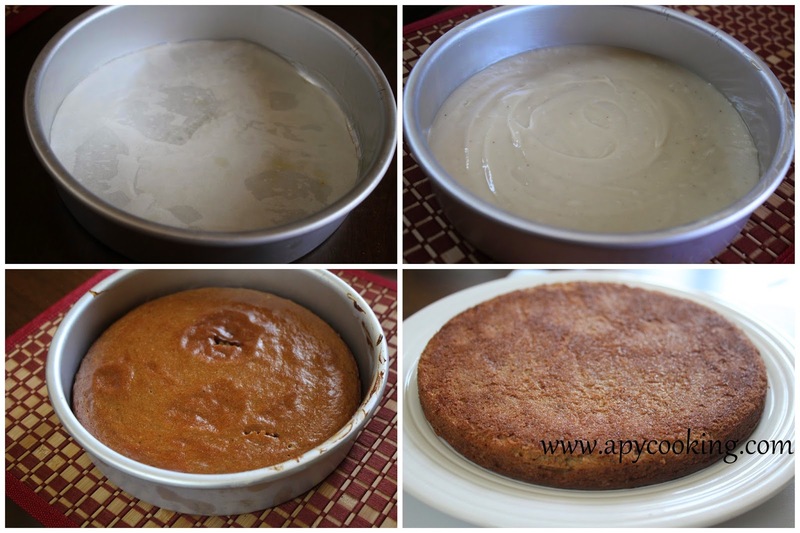 You don't have to grease too much and your cake will pop out right out when you invert the baking pan. 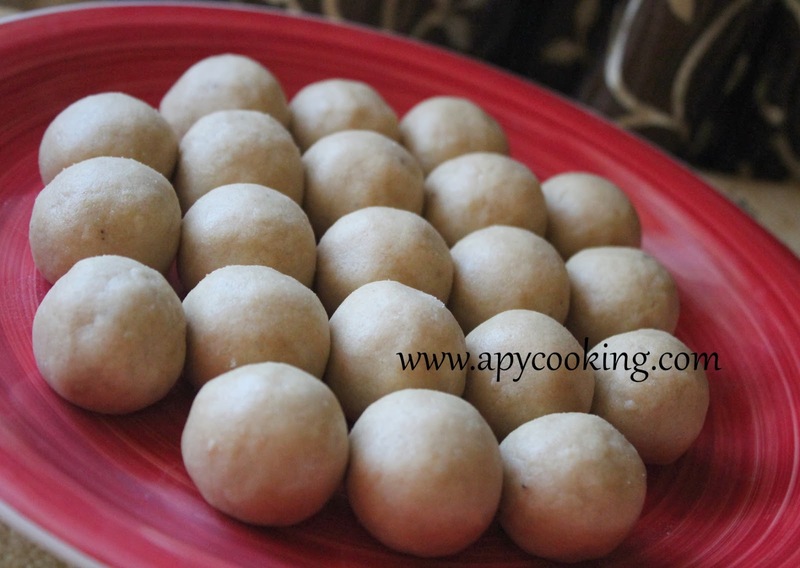 -Before using all purpose flour (maida), sift it to remove lumps/ impurities, if you wish to do so. To sift, just pass it to a large sifter / strainer. First mix the dry ingredients. 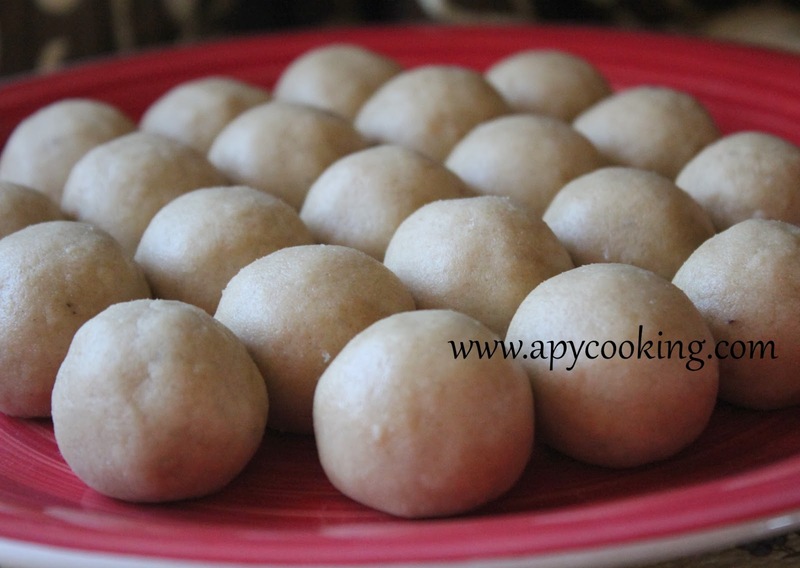 For this, in a bowl, add maida, baking powder and a pinch of salt. Mix well. Now in a large bowl, take some butter. The butter should be soft enough to be mixed easily. Add sugar and mix with a spoon or spatula. 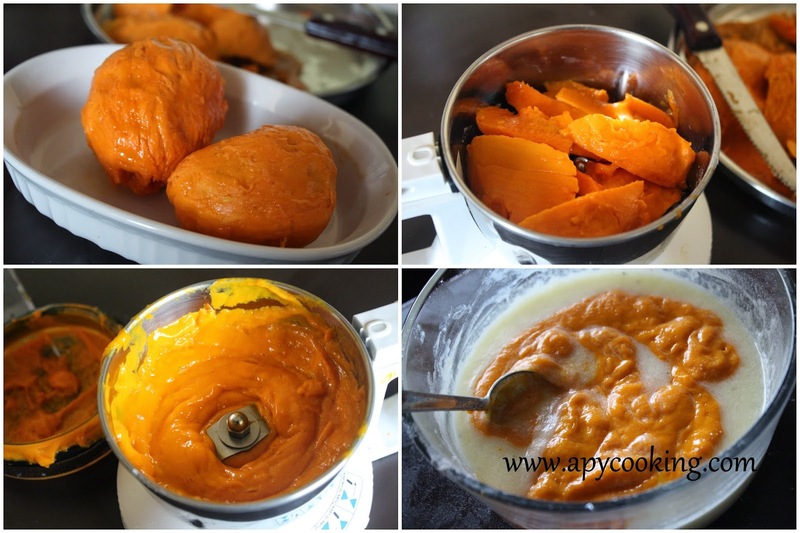 With a hand held electric mixer, blend the sugar and butter for a minute or two till you get a nice creamy mixture. Add eggs and vanilla essence [ Notice how well I've succeeded in highlighting the eggs and not focus on the "creamed" sugar and butter, because, well, it did not cream well] Blend to get a creamy mixture. 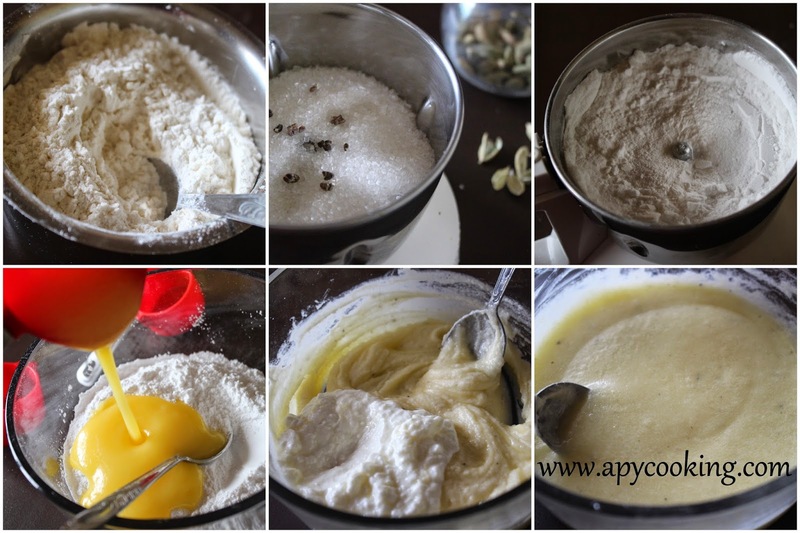 To this add milk and flour mixture [the dry ingredients which you had mixed earlier] little by little and blend gently as you add. Towards the end, mix well with a large spoon or spatula, scraping the sides. Preheat the oven to 170C [340F]. 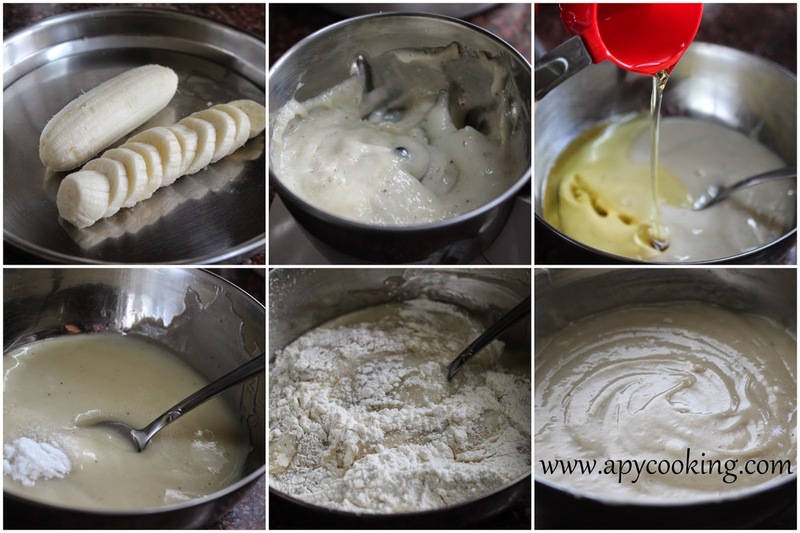 Grease the sides and bottom of an 8" or 9" baking tin with oil, butter or ghee. I also lined the base with parchment paper. Pour the batter into the tin. 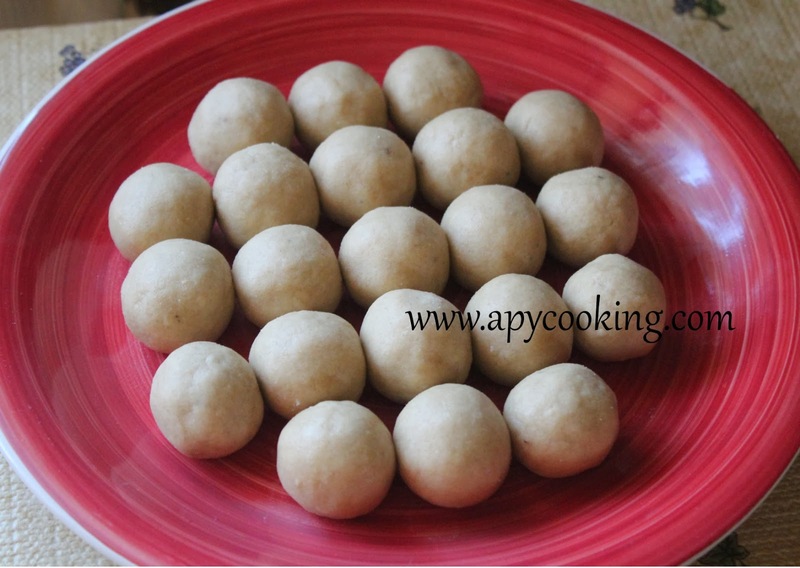 Bake for 30 to 35 minutes or till a fork inserted in the centre comes out clean. [ I baked for 35 minutes so the cake browned a little more, but the taste was great. Infact I like it that way. I'm not justifying]. Allow to cool and invert on to a cakeboard / plate. 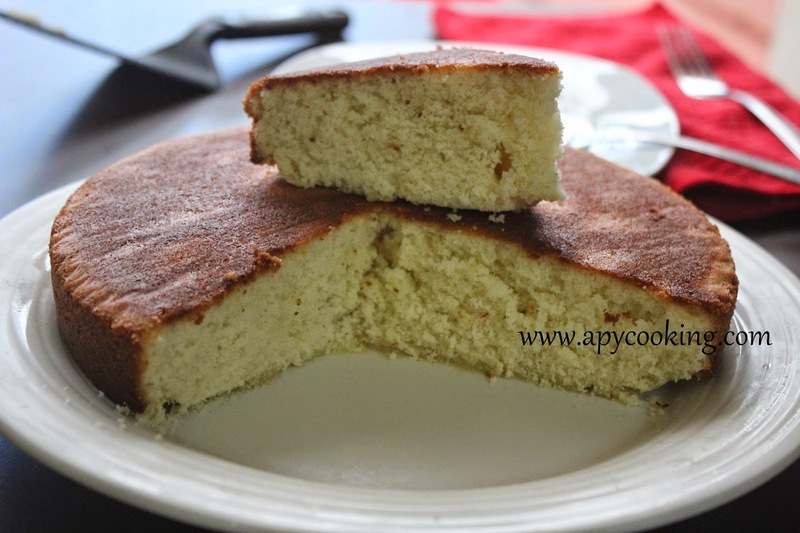 So now that you have a simple basic vanilla cake, you can experiment with flavours, fillings, icings, toppings and what not. Happy Baking!